In the last three years of his life, St. Josemaria Escriva traveled through several countries in Europe and South America meeting large groups of people in different cities around the world. The two DVDs contain abridged films of six of these meetings in different countries, each lasting approximately thirty minutes. It also includes a short, eighteen-minute biography of St. Josemaria called The Joy of Holiness. 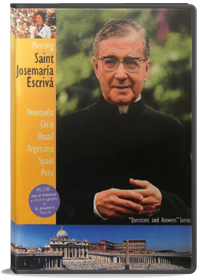 This DVD is being distributed by Midwest Theological Forum for the St. Josemaria Institute. For wholesale orders, contact Midwest Theological Forum at (630) 541-8519.